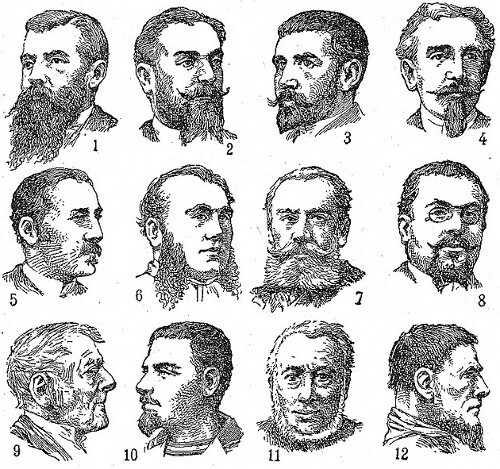 The Science of Facial Hair: What Signals Do Beards, Stubble, and Mustaches Send to Others? Wouldn’t it be nice if there was a yes or no answer to every question of aesthetics? It’s certainly how magazines and pop culture presents things when it comes to how a man should or shouldn’t look. But that’s rarely how the human brain works. As we’ve discussed before in regards to style, there are definitely some black/white rules, but for the most part each man needs to discover what works best for him. He needs to express himself through his style choices, within some basic frameworks. One fascinatingly complex issue that has come back into the spotlight recently is that of facial hair. It’s not something you can break down into basic good/bad or right/wrong strategies. It all depends on the individual. Forget anyone who tells you that beards are a 100% guarantee to be an alpha male lady-killer. Also forget anyone who says they’re an automatic job-loser and impossible to pair with a business suit. With a little bit of research, you can figure out the length and style of facial hair that’s right for your life, your career, and your goals. Does a beard look good on you? Should you shave the stubble before your date? Do you need to give yourself a trim before the big interview? Scientific research can tell you what other people are thinking when they look at your beard, which should give you a good idea of whether a beard is the right choice for your life. A beard is a sign of active testosterone in the body, and human brains recognize that as coming with the potential for more aggression. As a result, men with beards are often seen as more angry, aggressive, or dominant, even if their personality has none of those traits. In one study, photographs of bearded men and non-bearded men making the same aggressive facial expression (scowling, baring teeth, etc.) were compared. The bearded men were rated as significantly more aggressive and intimidating, even when all other factors were identical. That’s not inherently a bad thing — but it is a thing to keep in mind if you choose to wear a beard. For example, it’s never a great idea to be the guy at the front of a protest rally, face-to-face with the cops, and also sporting a huge beard! Since the ability to grow a beard is a sign of physical maturity in men, it is naturally associated with age and grown manhood — as is evidenced by a study that found that beards were associated with maturity, power, and higher social status by both men and women. Men with beards are also, predictably, perceived as being more “masculine” or “manly” than men without. A large 2013 study asked both men and women to rate photographs that showed one man with varying stages of facial growth. The longer the hair in the photograph shown, the more masculine he was rated. While beards are associated with dominance, power, and maturity, on the flip side of the coin, that kind of masculine image can make people feel a little intimidated; one study found that bearded men are perceived as 38% less generous, 36% less caring, and 51% less cheerful than their clean-shaven brethren. Likely for the same reasons that beards are seen as a sign of aggression, going beardless is often interpreted as a sign of being well-socialized and able to integrate with others. Breaking this down to any kind of alpha/beta male idea is oversimplifying — it has more to do with what makes a man look like he takes charge versus one who gets along well with others. Studies have found clean-shaven men to be more highly-rated in terms of social skills than their bearded brethren, based purely on still images — there was no actual observed socializing to base judgments on. Going clean-shaven gets you points for cleanliness, but beards aren’t necessarily seen as sloppy. In another 2013 study, it was stubble that took the biggest knock for perceptions of health and cleanliness. A patchy, light stubble was rated the lowest — most viewers interpreted it as a sign that the wearer didn’t groom regularly. That doesn’t mean people found stubble inherently unattractive. Different studies have found different amounts of facial hair most “attractive” (more on that in a minute). But as far as the wearer’s perceived health and cleanliness go, a clean shave is best, followed by a full beard.